Nathan is predominantly a playwright and theatre-maker. His writing credits range from adaptations to short plays. With his debut play still under development following a workshopping process, he is working on a new script that explores our collective inability to articulate ourselves efficiently and/or honestly. Other theatrical credits include the award-winning shows The Elephant Man (Director) and Confirmation (Performer/Director), the latter being a solo piece. He is also the founder and producer of the First Steps Festival, a post-graduate theatre festival based in Liverpool. Recently he was announced to be part of the writing team for Noises Off – the National Student Drama Festival’s official magazine. Despite being most active in theatre, he is interested in other art forms. He is a practicing singer-songwriter, currently working on an EP designed to be both a meditation and interrogation of male identity and culture. He is specifically interested in tackling philosophical dilemmas through a sociopolitical lens, and is fascinated in the analysis of the micro in the macro of the human condition. 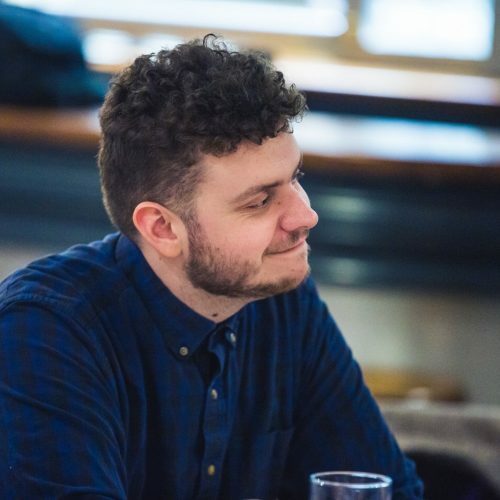 A graduate of LJMU Drama, he is now a member of Liverpool’s Young Everyman and Playhouse Writing scheme.